Obligatory disclaimer: I am just reflecting on my own personal goals as far as physical fitness is concerned, as well as what exercises and techniques work for me. Everyone is different, has different needs, physical abilities, genetics, limitations, etc. Basically, I am just talking about what level of fitness I want to maintain and how I go about doing that. I'm not a doctor or a trainer, just my opinion, don't sue me, etc. Now of course there are a few more things I wish I had covered in the video, as always. Just to be clear, all this talk of "fitness" or "being in good shape" can be quite subjective. For example, when I talk to non-long distance hikers or people that never go hiking, and I tell them how far I normally hike on a typical trip (20-30km a day), people are often shocked! To me this is no big deal, especially considering that I read backpacking forums where people claim to regularly hike 30, 40, and even 50+km in one day. I think if/when I do a thru-hike, after adapting to full time trail life, I would probably push things into the 30-40km range. Plus on my hikes I also get distracted quite often by things like foraging for wild edibles, swimming, fishing, taking pictures, etc. So for now my minimum goal of ~25km and max goal of ~35km suits me just fine. This next point should be a given, but just to make it perfectly clear, this discussion is about long distance hiking. Granted, this is another subjective term, but I think most wilderness backpackers would agree that perhaps 20km constitutes a "long" hike--and certainly 30km or more. A marathon, after all, is about 42km, so I'd say that anything around half a marathon and up is a long hike. And just as there are Ultra-marathon runners that can run more than 42km, there are Ultra-long distance hikers that can do the same insane distances in a day. 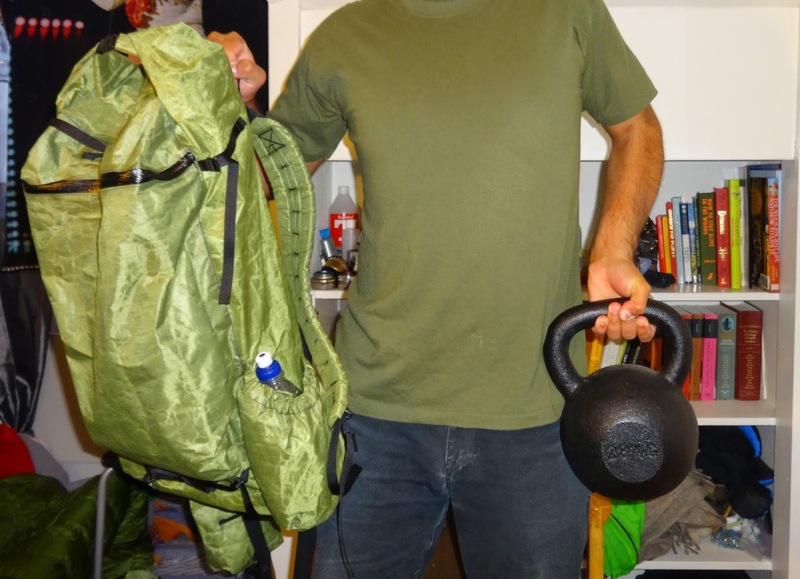 While I am familiar with several Ultralight backpackers that are also Ultra-long distance hikers--such as Andrew Skurka, Francis Tapon, and Cam Honan--I am not familiar with any "traditional" (i.e. base pack weight over 10kg/22lbs) that can do marathon-level daily hiking. Ultra-long distance hikers might be tempted to laugh at my own humble attempts at long distance hiking, and traditional backpackers that are not interested in hiking long distances might also laugh at what to them is pointless. But if you are interested in hiking long distances or just staying in shape, then perhaps the above video and the below information might be helpful and/or interesting to you. I am not saying that long distance hiking is "better" or "worse" than other kinds of hiking, of course. There is nothing wrong with shorter hikes, nor is there anything wrong with having around a 20kg base pack weight or more. Just thought it was worth noting all this, seeing as in my video above I referenced Ross from Wood Trekker's text regarding gear weight and physical fitness. There are people that are not only uninterested in long distance hiking and/or having a lighter pack, but are actually against/critical of both of these sub categories of backpacking--which Ross discusses (mainly the lighter pack issue) and is critical of (as am I, and agree with his assessment) in his article. However this text, as well as many others on my blog, are intended for people that are interested, to one degree or another, in hiking long distances in nature. As I note in my video, I am around 84kg/185lbs and 183cm/6ft tall. If you calculate my BMI (body mass index), I would be a 25.1, or just slightly past the mark for what BMI considers "overweight," which is from 25-29.9. While I could stand to lose a few kilos--vacation weight mind you, should be gone in a few months--I would like to think that my BMI number is a bit skewed due to muscle mass. This is a flaw that many people are critical of regarding the BMI scale. Worth mentioning before laying out my fitness strategies and routines, perhaps. What started as a rambling video has become a rambling blog post too. On to what I actually do in order to stay in shape so that I can continue to hike far in the woods with relative ease. Apart from backpacking itself, I divide my active lifestyle into three main activities: my main work out routine, walking, and running. My main work out routine was designed to give me a simplified but effective full body workout. I emphasize core strength and endurance, and muscle groups or functional strength rather than isolated muscles or bodybuilding. I want to be able to carry my pack without issue, as well as climb, lift, pull, push, and in general deal with (or at least deal with better) whatever the woods can throw at me. So let's start with my main work out. I try and do this at least once a week, but obviously this doesn't always happen. When I feel like I am getting out of shape, I grit my teeth and force myself to do it twice a week. I make sure to do it not too long after I have eaten something, and always eat something after I finish working out (usually a banana with peanut butter on it) along with drinking plenty of water. Breathing and form are also very important factors in any work out regiment and should not be overlooked, I would add. During each pause in my workout I make sure to focus on my breathing, and if I botch a repetition I will repeat it. Pause for 2-3min break, then grab my 28kg kettle bell. 5. Two handed kettle bell swings, 3 sets of 30-35. Pause for 2-3min in between sets. 6. Two handed kettle bell lifts, 1 set of 10-15. I couldn't find a good example video of this technique, but it's just standing square while holding the weight in front of you (in front of your groin) and lifting it straight up in front of your face. Pause for 2-3min break, then grab my 16kg kettle bell. 7. One handed kettle bell overhead lifts, 1 set of 10-15 for each arm. Start with my arm loose and hanging down to the side of my body, then lift up to my shoulder, and then up again fully extending my arm above my head. 8. Two handed kettle bell front raises, 1 set of 10-15. Again, couldn't find a good video example, but it's again standing square while holding the weight in front of you (in front of your groin) and lifting it straight out--arms straight--in front of your face. 9. Hindu squats, 1 set of 50-60. 10. Pull ups (palms facing me), 2 sets of 6-8. The walking and running aspects of my active lifestyle are pretty straight forward. I try and walk as much as possible in mundane tasks, like dropping off my kids at school or going to the market to buy food. I also try and take walks to do pull ups once or twice a week. There is a set of pull up bars in a park near my house, which is convenient. When I feel like my cardio is not up to par, I will do more running--once a week or so. But in general I don't like to run, and do it about once a month. I run with barefoot shoes, it should come as no surprise if you follow my blog. I run only as much as I can tolerate, which is only around 3-6km. If I really want to give my cardio a big kick, I will do sprints up a small hill near my house--but this is rare, as my cardio is usually good enough to handle my typical hikes without much issue. Now I know that I said I would discuss nutrition and food in the video, but this is already a pretty long text. So I won't write too much about it other than some simple tips that try and stick to that are pretty well known and in general good for you. For instance, the grand majority of what I drink as a beverage is plain water, coffee (no sugar), and tea (no sugar). I think I have maybe 3-4 sodas a year. I love food and eat plenty of good, rich food--and I can eat a lot. Rather than change how much I eat or cut out rich food from my diet, I simply strive to maintain an active lifestyle so that I can burn off what I eat. If I eat things that are junk foods a lot one day, the next day I will try and eat healthier foods. I try and keep it simple and pragmatic, much like my work out, so that both are easy to stick with. I won't get into the complex debate on what kind of food is best, as it is a very personal choice with a lot of important variables for each individual. But I will say this: what nearly every expert can agree on when it comes to what a "healthy" diet is, generally means eating a lot of vegetables. As far as what my diet is, well it's a bit complicated as I have a stomach condition, that I also don't want to get into too much. Dairy and most meats don't agree with my guts, so I avoid dairy (but cheat sometimes) and only eat certain fish and most shellfish. My wife is a long time vegetarian who cheats on occasion and eats certain shellfish. So we have usually have plenty of veggies around our house. Point is, the grand majority of my diet is plant based. I've really got to wrap this wall-o-text up. I hope that if you are either looking to get into better shape to have easier/longer backpacking trips, or maintain a not-bad level of fitness for long distance hiking, and that this video and text are helpful. Again, one of my main reasons I try and stay in shape is to be able to not only continue to go on long hikes, but so that long hikes are relatively easy.